Jewish refugees in Anatevka celebrate the opening of the community’s new synagogue, Feb. 29. ANATEVKA, Ukraine — At the age of 53, Sergey and Elena Yarelchenko fled their native city of Lugansk with three suitcases and moved into a wooden room in a muddy refugee camp outside Kiev. Named after the fictional hometown of Tevye the Dairyman from the famed Broadway musical Fiddler on the Roof — and the iconic Sholom Aleichem short stories on which it was based — Anatevka is a tribute not only to that town but to the real Jewish shtetls that dotted Eastern Europe before the Holocaust. 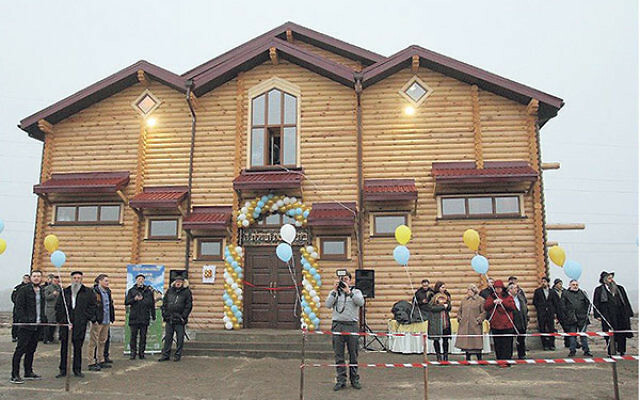 Spread on a plot the size of three football fields, Anatevka features a wooden synagogue with two mikvot. A rickety path made of splintered wooden pallets connects the three-story synagogue building to a dormitory-style residence with 20 apartments and a central kitchen. A ways off is a school newly built from concrete with 25 classrooms. “Our son in Israel is pressing us to make aliya, but Anatevka looks like a better option for us,” said Elena Yarelchenko. Working with money from his own pocket and private donors, Azman has spent more than $1.5 million on Anatevka, which he designed not only to serve as a refugee center, but as a living, breathing community.